Frank Hier helps Girl Scout Lindsey Pagan with roping during the horse show events. 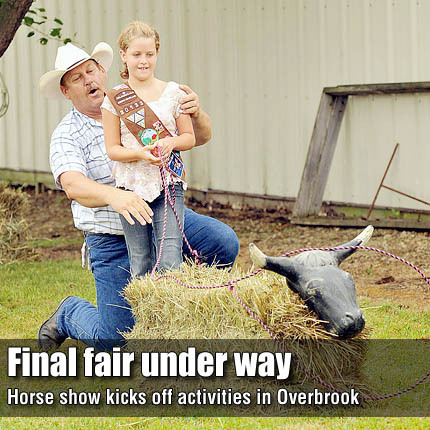 The Overbrook Osage County Fair kicked off Aug. 6 with the horse show, and picked up Wednesday with the continuation of 4-H events, lawnmower pull and the beginning of the carnival. Events today (Thursday) include the swine show, tractor pull and pedal pull, along with wristband night at the carnival. The calf, dairy and goat shows are Friday, along with the first running of the parade. A country music show will follow the parade. The final day of the fair includes the rabbits, poultry, hand pet and dog shows; children’s games; livestock sale; battle of marching bands; parade; and demolition derby.